Chocolate Santafereño is popular all around Colombia, especially in Bogotá, the countries capital. 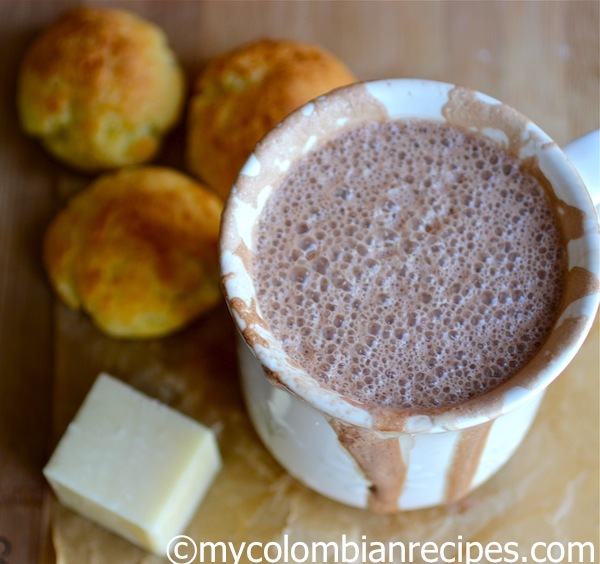 Hot chocolate is a staple in almost every Colombian home. 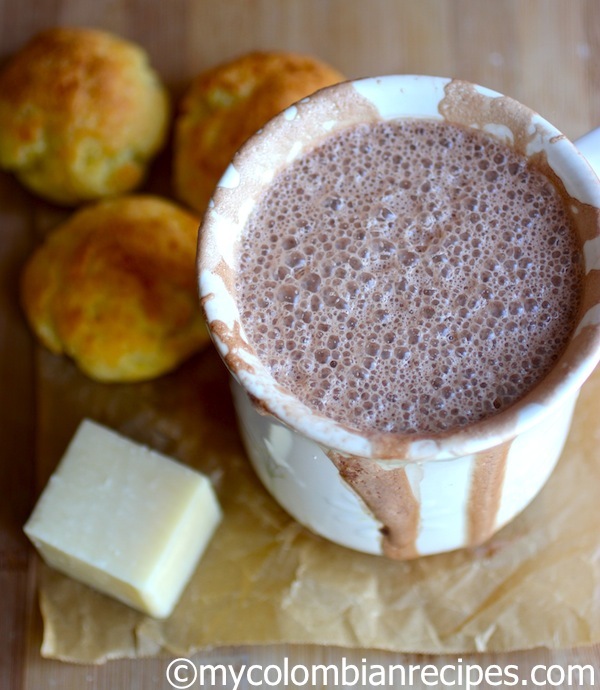 In my family, as good “paisas”, we drink this hot chocolate at breakfast with arepa and cheese and sometimes as a “merienda”, an evening snack with Colombian pastries or bread and cheese. If you would like to make Chocolate Santafereño as we do in Colombia, you’ll need two old-fashioned Colombian kitchen gadgets, which you can get at my store. A “chocolatera” and a “bolinillo” (or molinillo). Have fun! Whisk vigorously or transfer to a blender. Reheat gently and serve immediately. Erica, I love hot chocolate. Especiallly to dip churros into. What kind of chocolate do you use? A specific brand? I use “Chocolate Luker” it is from Colombia, if I don’t have that one I use Goya. 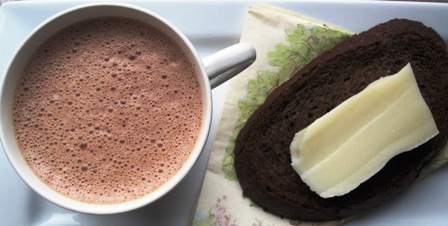 Yum… I love hot chocolate and the addition of cinnamon is so fabulous! I think I will have to whip some of this up this weekend! This looks really delicious for those toasty cold evenings coming up. I love the cinnamon addition. Hi Erica, can I use cocoa powder + sugar instead? I wanna try this recipe and I have some cocoa powder but not sweet chocolate on hand. Thanks. Yum! Chocolate and cinnamon! Looks so rich, Id love that for my breakfast right now! Yes, you can use cocoa powder. oh yum, cinnamon and chocolate is the perfect combo! I discovered this website yesterday and I am excited since I love Colombian people and their food. I learned how to make Colombian hot chocolate from a Colombian baker in NY and it is awesome! Looking forward to receiving more of your newsletters. BTW I already have the molinillo and the bars of LUKER. The best one is the sugar-free one so you can adjust the sweetnes. I just had hot chocolate and home made buñuelos for breakfast 🙂 Yummy!! I could use a cup of this delicious hot chocolate right about now. Thanks for the recipe! I love hot chocolate specially with cinnamon, and loved the new site by the way. 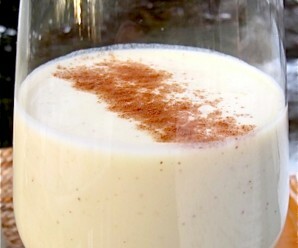 Cinnamon love, but the difference of adding a bit of nutmeg as well…. becomes ADORE… and very paisa!!!! pues!!! You put the cheese into the cup of hot chocolate. I’m surprised this important detail was missed in the recipe. 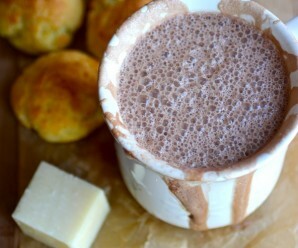 It’s the best part to spoon out the melting cheese as you enjoy sipping the hot chocolate. I was taught by my mother’s sewing circle that I have to let the milk boil up three times before it could be ready… makes for REALLY hot, hot chocolate. Mmmm, with a little queso campesino melted inside! That is so funny! My Colombian husband says his grandmother boiled the chocolate 4 times! I have wondered if this was because the milk might not have been pasteurised back then. And as for the blender vs. molinillo, I find that the molinillo cannot produce the same amount of “espuma” as the blender. Also, I have knocked over the “olleta” too many times on the stove! Hey hun can I use some semi sweet chocolate chips it looks delicious but it is all I have at the moment? I don’t know, but you can try it and let me know! This looks like the hot chocolate my family makes, but we will drop cheese in it. I have not been able to find a cheese here in the states that create a similar taste and melt the cheese the same. Any suggestions would be great. I love chocolate but I am having a difficult time finding it. any ideas of where I could find it. We like Corona Chocolate from Colombia. I have been able to purchase this on Amazon and sometimes I can find it in Latino supermarkets or special markets that specialize in international foods. I use only chocolate balls found hand made from Colombia . I fill up a backpack every time I visit . 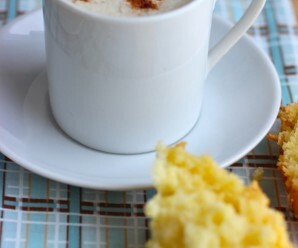 I have many fond memories of starting the day with a mug of chocolate con queso and an arepa. It was best when working high in the mountains, where mornings were rather chilly. 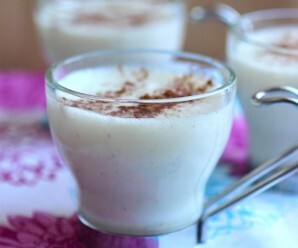 Thanks for the recipe which dredged up the memory! I love your website Erica, since I arrived to Texas five years ago. I will like to know which cheese do you use for the Chocolate santafereño, ive tried mozzarella but it doesn’t melt as it should. Any suggestion! ¡Gracias! As a Colombian and from Bogotá expat I don’t recall ever using cinnamon in the recipe. Not saying it doesn’t add another layer of flavor for those who like cinnamon (not me), but I don’t think it is truly the traditional chocolate santafereño. Additionally it is a staple leaving the discotecas in the wee hours of the morning before heading home. I can recall many places along La Caracas and a hole in the wall just down from La Universidad de los Andes where you could get one around 3-4 in the morning.